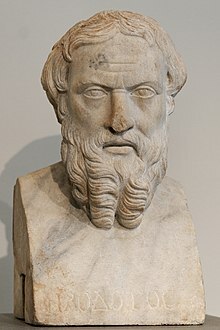 Herodotus of Halicarnassus (Greek: Ἡρόδοτος, Hēródotos) (c. 484 BC – c. 425 BC) was a historian, known for his writings on the conflict between Greece and Persia, as well as the descriptions he wrote of different places and people he met on his travels. I know that human happiness never remains long in the same place. When this response reached Croesus, it afforded him far more pleasure than anything else the oracle had told him, because he was sure that a mule would never replace a man as the Persian king, and that in consequence he and his descendants would rule for ever. He next turned his mind to investigating which was the most powerful Greek state, so that he could gain them as his allies. As a result of his enquiries, he discovered that Lacedaemon and Athens were the outstanding states, and that Lacedaemon was populated by Dorians while Athens was populated by Ionians. For these two peoples—the one Pelasgian, the other Hellenic—had been pre-eminent in the old days. The Pelasgians never migrated anywhere, but the Hellenes were a very well-travelled race. When Deucalion was their king, they were living in Phthia, but in the time of Dorus the son of Hellen they were in the territory around Mounts Ossa and Olympus, known as Histiaeotis. Then they were evicted from Histiaeotis by the Cadmeans and settled on Mount Pindus, where they were called Macedonians. Next they moved to Dryopis, and from Dryopis they finally reached the Peloponnese and became known as the Dorians. Variant translation: In peace, children inter their parents; war violates the order of nature and causes parents to inter their children. It was a kind of Cadmean victory. Book 1, Ch. 166, refering to a victory where both sides suffer extreme losses. Derived from the legends of Thebes, where the sons of Oedipus, and hence descendants of Cadmus, fought to the death. I am going to talk at some length about Egypt, because it has very many remarkable features and has produced more monuments which beggar description than anywhere else in the world. From great wrongdoing there are great punishments from the gods. Now, that these descendants of Perdiccas are Greeks, as they themselves say, I myself chance to know. Book 5, Ch. 22, 1 (Loeb). But Alexander (I of Macedon), proving himself to be an Argive, was judged to be a Greek; so he contended in the furlong race and ran a dead heat for first place. Book 5, Ch. 22, 2. It is the gods' custom to bring low all things of surpassing greatness. Book 7 , Ch. 10. When life is so burdensome death has become a sought after refuge. Variant translation: It is better by noble boldness to run the risk of being subject to half of the evils we anticipate than to remain in cowardly listlessness for fear of what might happen. The Lacedaemonians fought a memorable battle; they made it quite clear that they were the experts, and that they were fighting against amateurs. That we who lie here obeyed their commands. "At sea your men will be as far inferior to Greeks as women are to men." (By Artemisa, the best persian warrior in Salamina, a very courageous woman. A superbe irony!). "My men have turned into women and my women into men!" Appears carved over entrance to Central Post Office building in New York City. Herodotus actually attributes this to Solon in a conversation with King Crœsus. Many very wealthy men are not happy, while many who have but a moderate living are fortunate; and in truth the very rich man who is not happy has two advantages only as compared with the poor man who is fortunate, whereas this latter has many as compared with the rich man who is not happy. The rich man is able better to fulfil his desire, and also to endure a great calamity if it fall upon him; whereas the other has advantage over him in these things which follow: — he is not indeed able equally with the rich man to endure a calamity or to fulfil his desire, but these his good fortune keeps away from him, while he is sound of limb, free from disease, untouched by suffering, the father of fair children and himself of comely form; and if in addition to this he shall end his life well, he is worthy to be called that which thou seekest, namely a happy man; but before he comes to his end it is well to hold back and not to call him yet happy but only fortunate. Now to possess all these things together is impossible for one who is mere man, just as no single land suffices to supply all things for itself, but one thing it has and another it lacks, and the land that has the greatest number of things is the best: so also in the case of a man, no single person is complete in himself, for one thing he has and another he lacks; but whosoever of men continues to the end in possession of the greatest number of these things and then has a gracious ending of his life, he is by me accounted worthy, O king, to receive this name. The History of Herodotus Book I, Chapter 32. Actually a quotation from a letter of Lord Chesterfield dated May 8, 1750. Though widely attributed to Herodotus this in fact comes from the Histories of Polybius, Book 16, chapter 28: "Some men, like bad runners in the stadium, abandon their purposes when close to the goal; while it is at that particular point, more than at any other, that others secure the victory over their rivals". (Translation of Evelyn S Shuckburgh).